Bio-Hydrate is a next generation, ultra concentrated, plant based bio-wetting agent, penetrator and bio stimulant that is 100% plant safe and non-toxic. Why should I use Bio-Hydrate? Bio-Hydrate works to reduce the surface tension of water repellent media, to ensure an even soaking and distribution of water and nutrient solutions even on very dry surfaces, leading to improved growth and plant health with a reduction in overall water inputs. Bio-Hydrate also acts to increase the penetration of nutrients and can be used as a wetter in combination with all Better Organix liquid plant feeds and additives, mycorrhizae, bacterial inoculants and as part of a compost tea program. Bio-Hydrate has a low pH which helps maintain acidic conditions in growing media. Unlike many inorganic wetting agents, it does not stress or kill natural soil biology but acts as a biostimulant to boost the populations of beneficial soil microorganisms. When should I use Bio-Hydrate? 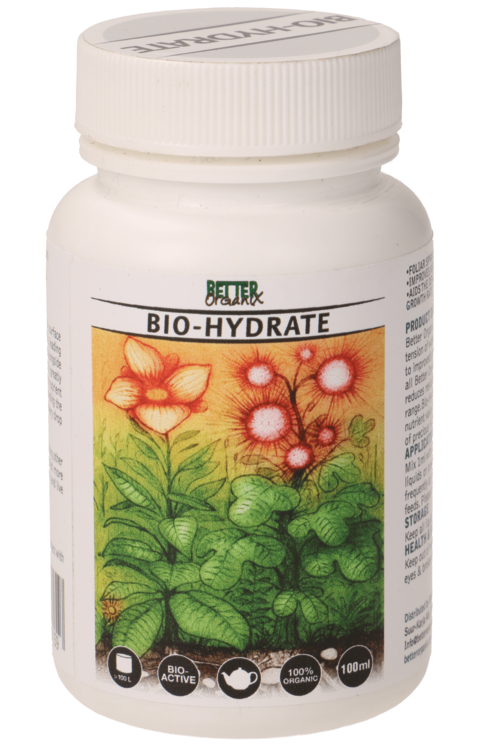 Bio-Hydrate can be used at all times of your plants growth cycle. It can be added to both soil feeds and foliar leaf sprays from seeds and seedlings, to fully mature plants. How do I use Bio-Hydrate? Bio-Hydrate can be applied alone, in combination with inorganic or organic nutrients, tank mixed, used as a soil drench and as a foliar to increase nutrient coverage. 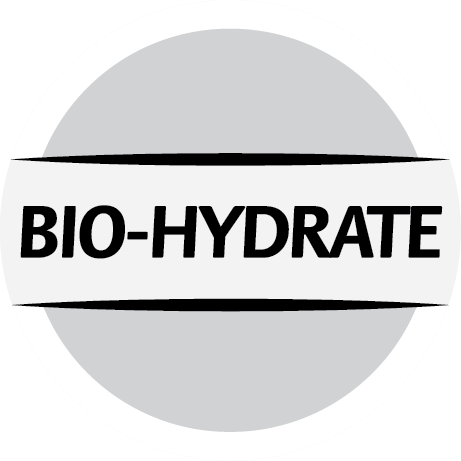 Bio-Hydrate is an extremely powerful product and should be used at a rate of 0.25ml/L. 5 drops per litre of chlorine free water. Can also be used as part of a compost tea program and can be added at any stage of the brewing process. What media types are suitable for Bio-Hydrate? Use Bio-Hydrate on any media types. Some care may need to be taken if growing plants in alkaline soils. In these cases, Bio-Hydrate can be teamed with Bio-Balance Media and other Better Organix liquid plant feeds to increase impacts on alkaline loving plants. What is the pH range of Bio-Hydrate? The pH value of Bio-Hydrate is 3.7- 4.1 and so it typically lowers the pH value of both growing media and your nutrient solutions. Suitable to be used at any pH range, though is very well suited to media types seeking slightly acidic conditions.